Q1. 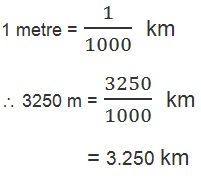 Give two examples each, of modes of transport used on land, water and air. Ans: Two examples of each. Land transport: bus and train. Water transport: boat and ship. Air transport: Helicopter and aeroplane. (iii)Motion of a child on a swing is ______________. Q3. Why can a pace or a footstep not be used as a standard unit of length? Ans: Standarrd unit of length must have a fixed numeric value while footstep does have so. 1 metre, 1 centimetre, 1 kilometre,1 millimetre. Q5. The height of a person is 1.65 m. Express it into cm and mm. Q6. The distance between Radha's home and her school is 3250 m. Express this distance into km. Q7. While measuring the length of a knitting needle, the reading of the scale at one end is 3.0 cm and at the other end is 33.1 cm. What is the length of the needle? ceiling fan that has been switched on. Similarities: the motion of a bicycle and a celing fan both have circular motion. Differences: The bicycle moves on straight line but ceiling fan does not move so. Q9. Why could you not use an elastic measuring tape to measure distance? What would be some of the problems you would meet in telling someone about a distance you measured with an elastic tape? Q10. Give two examples of periodic motion. (i) The motion of child on a swing. (ii) moving here and there the branches of tree.